You can now explain with confidence what p-doping, n-doping, and depletion layers mean. Now you will put that knowledge to use. You have the transistor in your hand. You stare at it, knowing the power it contains and what it has done for the world. Here you will use your transistor to amplify some spikes. In the previous Transistor lesson plan, you learned the theory. 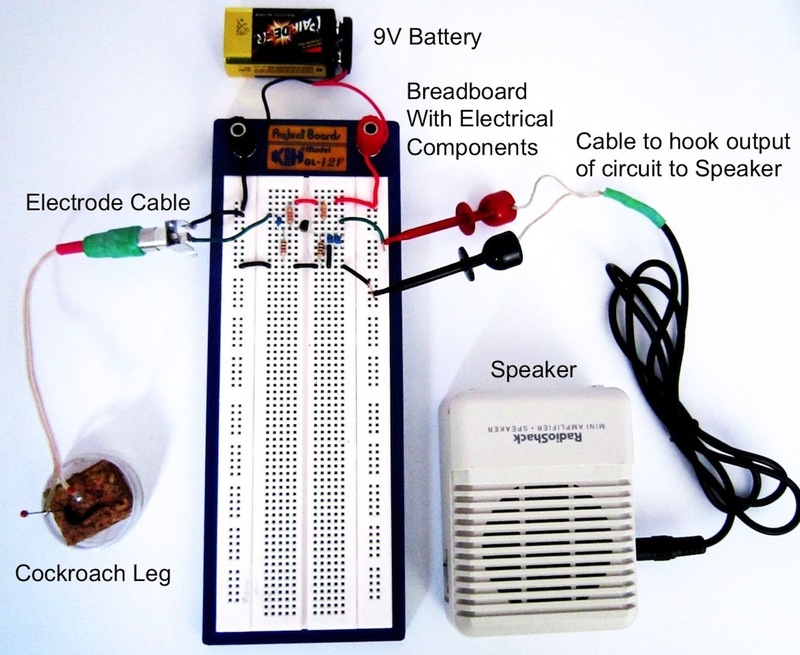 Now you will apply it and build your own simple amplifier circuit from scratch using two transistors and some various resistors/capacitors. 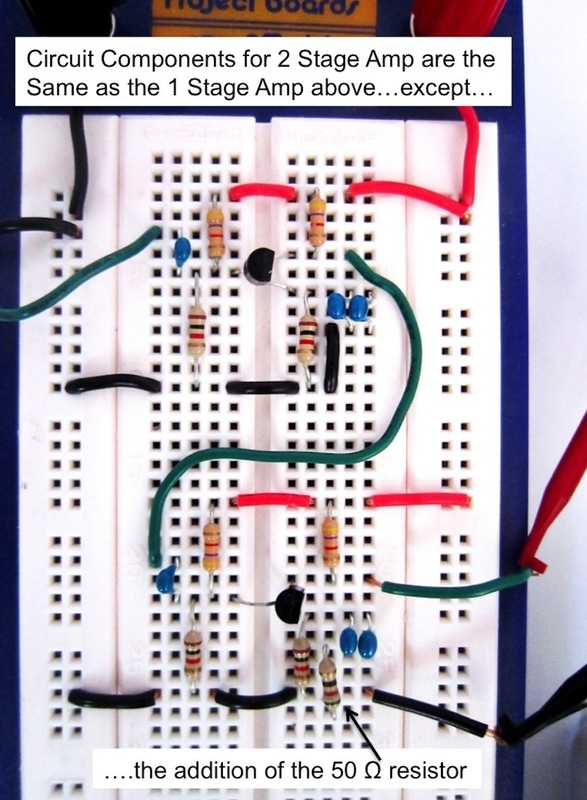 Note: This circuit was designed when we were just learning how to teach transistor function. Wiser now, we know there are some errors below in the math with the filter calculations. We will redesign this circuit when time and resources permit, but note that the circuit still works (can amplify spikes). 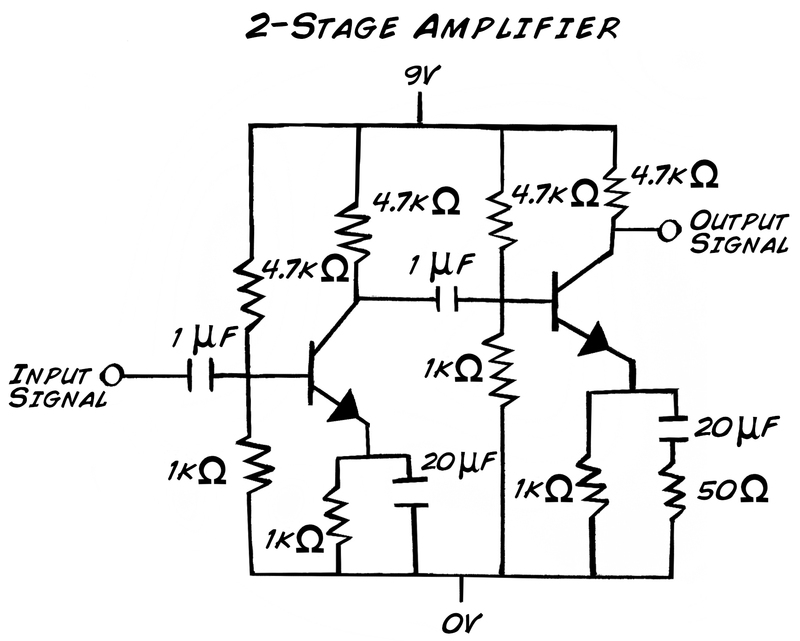 In order to build an amplifier, all you need are a transistor, a power source, some resistors, and some capacitors. There are many ways to mix these together, which is an art (Steve Jobs often called laying out circuits "digital art"), but we will give you some basic conditions and assumptions to work with and then walk you through the design of your very first simple bio-amp! There are multiple configurations using NPN transistors, but we will use the "common emitter configuration" because it allows us to have high voltage gain. 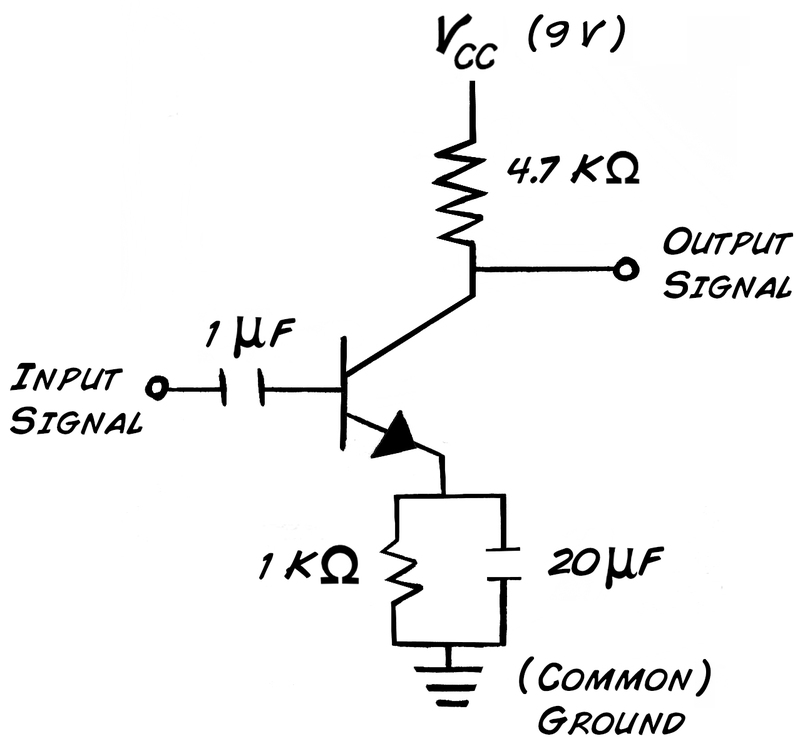 Why is it called a "common emitter amplifier?" 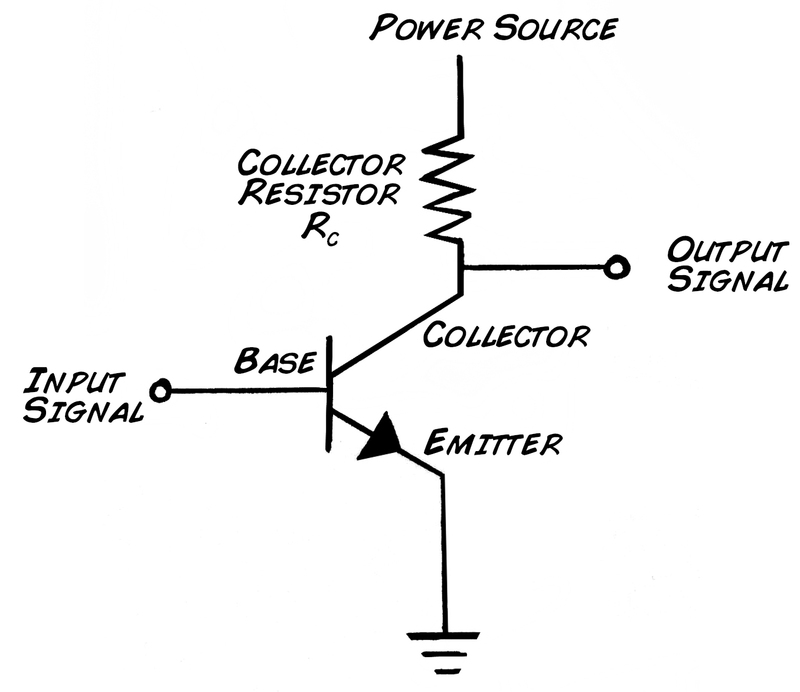 - because the base is the input, the collector is the output, and the "common" or ground is the emitter. Like any diligent engineer, let's start with the "requirements" which is a boring way to say: "what we want this machine to actually do." For our bio-amp, we want to "amplify" the very small electrical signals in the cockroach nerves. 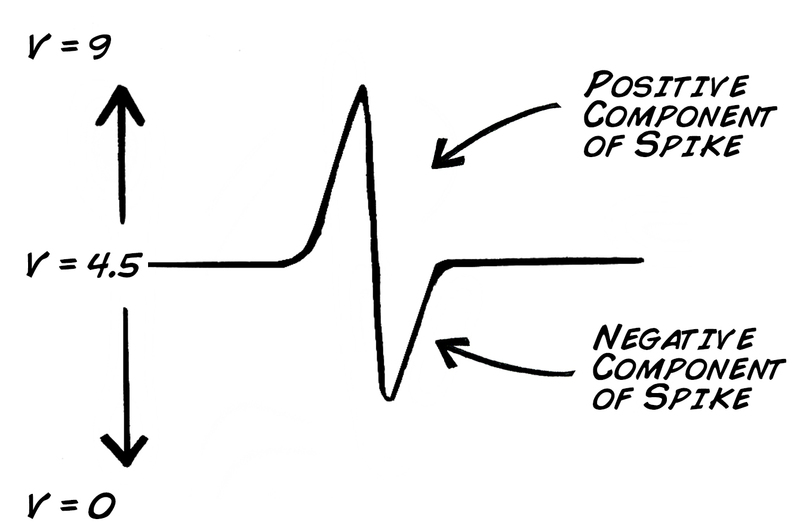 Let's aim for a "gain" of 150, or increasing the amplitude of the signal 150 times. We also want to limit what we amplify to ensure we are only paying attention to spikes (action potentials) and not other electrical signals like electrical noise from your house. So, like the real SpikerBox, we only want to measure signals with components above 300 Hz (cycles per second). This is also called "high-passing" the signal. Filter setting: high pass filter of 300 Hz. Now back to the art of electronics design. We base our amp heavily from the very excellent book "Practical Electronics for Inventors" by Paul Scherz. You also need a small piece of cork or styrofoam to lay the cockroach leg on. 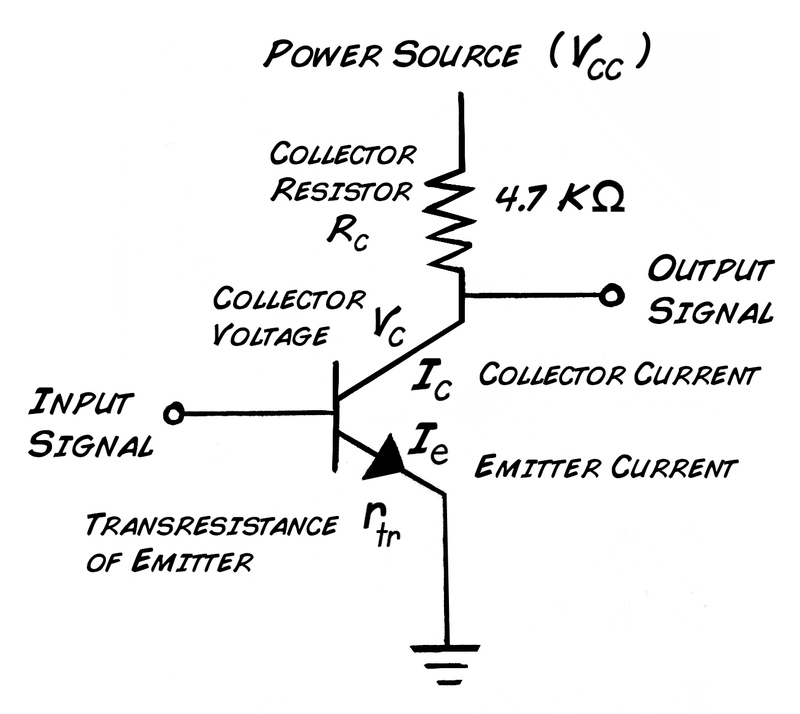 Ic is the current through the collector and function of the transistor (you use the data sheet of the transistor to calculate it). We will use a value of 1 mA for Ic. 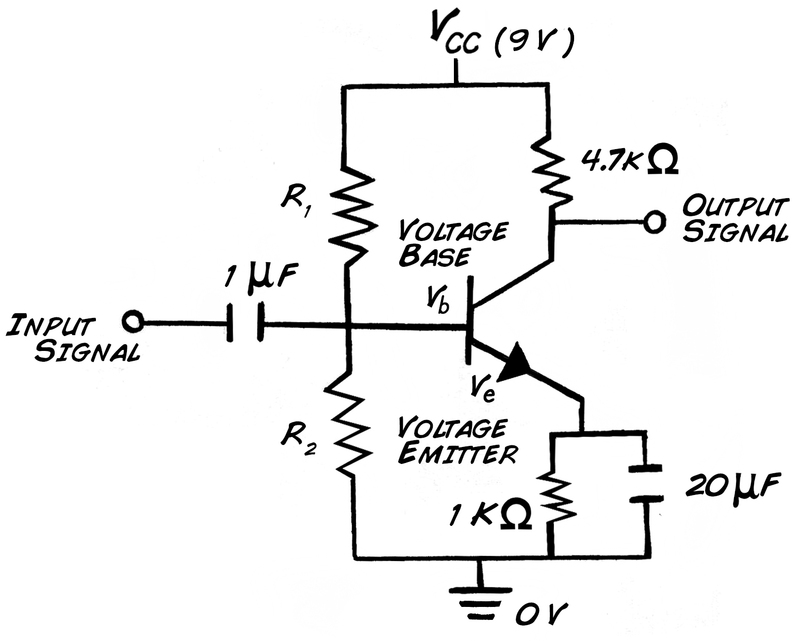 The gain of our circuit as it stands at ΔVc/ΔVe which is equal to the ratio of Rc/Re. 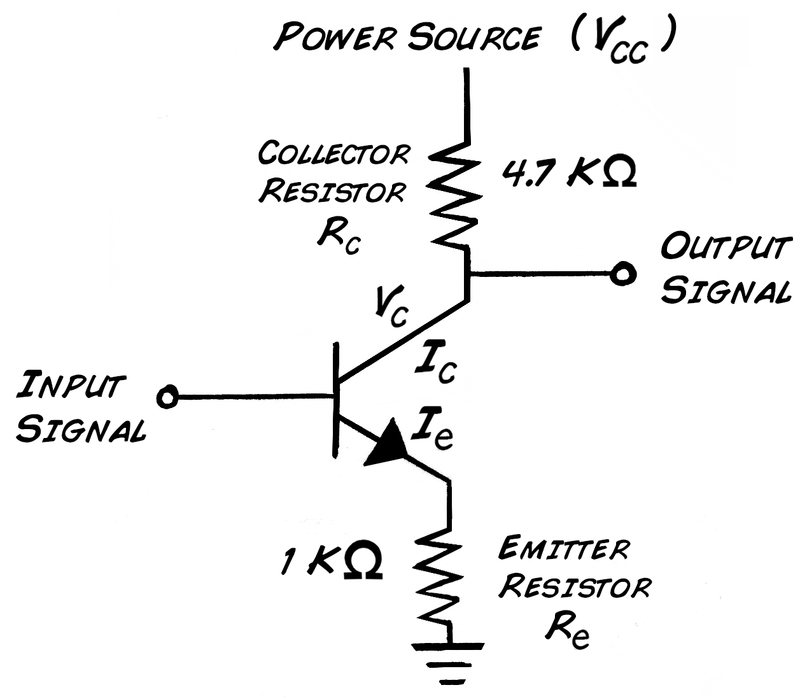 Ie is approximately the same as Ic, so the transresistance is thus 26 Ω. 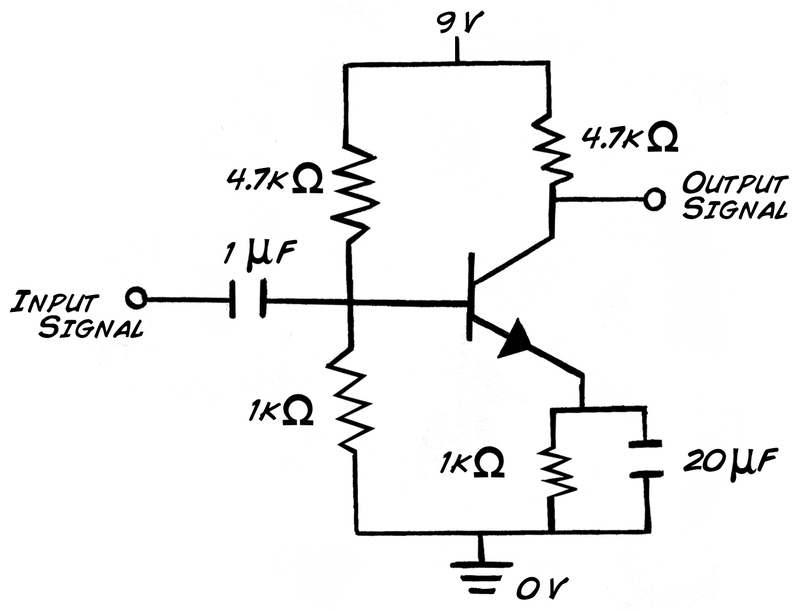 A resistor and capacitor in parallel act as high pass filters, and, as stated above, we want our high pass to 300 Hz. This is easy to calculate. We already have R = 1 kΩ, and the f should be 300 Hz, so the capacitor is thus 20 uF. All that remains is the input capacitor to remove any DC offset on the input signal and keep our circuit stable. Let's just set it to 1 uF. Remember from our transistor theory that the transistor will not switch on without a lower limit voltage push, and this is approximately 0.6 V for silicon-based circuits. We need to add bias resistors. We know Ve to be 1V due to the voltage drop calculated above, so Vb should be 1.6V. We will make a voltage divider! So, we'll just select R2 = 1 kΩ, and R1 = 4.7kΩ as values, since we are already using these resistor values and have them on hand. However, you will find this "doubling up" makes the circuit slightly unstable, so let's drop the gain a bit on the second stage. We've added a 50 Ω resistor in parallel with Re to lower the gain of the second stage a bit, but will still make for louder spikes when you hook up up this circuit to your cockroach leg. See video below. 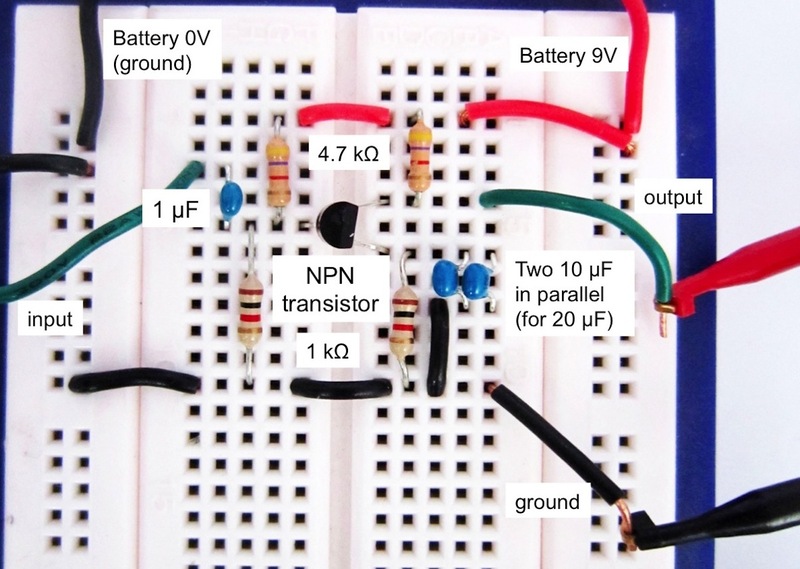 You have now built your very own amplifier with transistors! Congratulations! Let us know if you have figured out a way to make the circuit simpler, cleaner, and with more amplification. You are on your way to inventing many more wonderful things. The history of science is defined by the invention of new equipment in the hands of imaginative minds. The telescope allows you to see things very far away. The microscope allows you to see the very small. The PCR machine allows you to measure molecules of DNA, and the transistor allows you to observe tiny electrical signals. With these tools we can see and attempt to understand the world beyond the ability of our naked senses. Now begin discovering. Why are the spikes from our simple two-transistor bioamp "noisier" than the SpikerBox? What does the SpikerBox do? Hint: the SpikerBox has many more transistors and uses them to build operational amplifiers, which are then further mixed into instrumentation amplifiers. Welcome to the Art of Electronics!